It’s a new year with new opportunities and new mazes! This time we’re going to be talking the second maze variant: Obfuscation. In this maze variant, obscuring knowledge and altering the map were the main goals. Today, I will be talking about the process of choosing the design for this variant. The theme in this section of the story is the obfuscation of information. The design had to find a way to take the player’s knowledge and flip it on its head. You thought this was a good path back to the center? Think again! A good design would make the player question everything they learn and have them reevaluate every scenario. The first design I created revolved around an idea that seemed simple on paper, but proved to be much more complex in practice. For this design, the maze itself would be playing against the player. On a set timer the maze would change shape, shifting walls to create new pathways, while closing off old ones. Each maze would have 3 different shapes. It seemed simple enough; each maze would just need two extra boards that would be slowly shifted to. But as I began designing sample maps, it quickly became apparent that this design would require significantly more art per board. Because we commission each art piece, would this design be so spectacular that it would be worth tripling our budget? Beyond that the task would require a significant overhaul to the current architecture of the maze’s code to allow it to support several boards per maze. From a design standpoint, there were a lot of restrictions that had to be placed on the boards to stop them from becoming problematic. Boards couldn’t have closed off areas or areas that could accidentally trap the player (or monster). Boards had to feel similar while also being completely different. The player had no agency over when it would shift, making it frustrating to play with and would also cause strange bugs if the board shifted while the player was in movement. The next design I tried was based on a Pokémon gym. 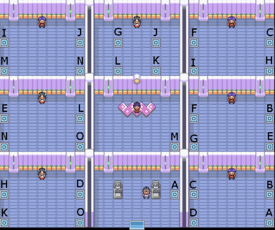 In this gym, the player had to navigate several nearly identical rooms with teleporters in each corner. In the image below, the teleporters are labeled, but in the game itself, they are not. This creates a confounding puzzle and makes you question where you are and where you will be next. While this design worked well for Pokémon, it ultimately was not a fit for Remember, Remember’s maze design. It ended up requiring a lot of animation and generating monster AI issues that could not be fixed in our development timeline. 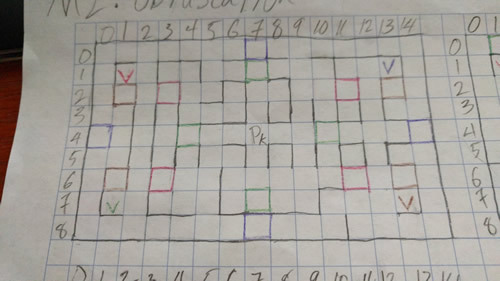 Issues such as “What happens when a monster steps on the teleporter?” “How will the pathfinding algorithm account for the teleportation?” With all this in mind, I dropped Saffron and went searching for another idea. Now with 100% more color! The third and final design was blocks. These were simple squares that would appear throughout the maze and block off previously traversable paths. This idea was born from treading over old ground in Design 1. How could I significantly change the maze without requiring an entirely new board to be created? By blocking off paths! Mazes are defined by their paths and by just adding a single block, the maze becomes significantly different. The blocks not only blocked paths, but light as well. The blocks are triggered by saving a victim, meaning every time a victim is saved, the maze becomes more and more obscured. The path that the player took to reach the victim is very likely blocked off and they must now find a new way through the maze with their limited paths and vision. Linking the blocks to the victim also gave the player a lot of agency over when and how the maze shifted. So rather than feeling like the game is fighting them by randomly shifting, the player has some say in it and can feel like they are strategically fighting the maze as it tries to stop them from achieving their goal. Next week I’ll be back discussing design and technical issues I had with implementing blocks. They may have been the solution I decided to stick with, but there were many obstacles along the way. Next Next post: Remember, Remember is on Steam Greenlight NOW!